Arriving at Antic just as we were about to go to press, the long-promised XEP80 80-column box is being manufactured at the Atari Corp.'s Taiwan manufacturing center and should be available in stores for $79.95 by the time you read this. The XEP80 displays 80 columns and 24 rows of readable text on your screen. On monochrome monitors, this text is razor-sharp. It's also quite readable on a color monitor, though naturally the characters are smaller than standard 40-column Atari text. Either way, the XEP80 is far superior to any software-only commercial products that produce an 80-column display. 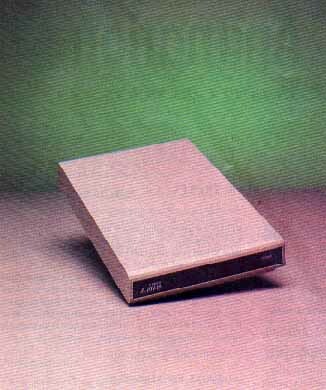 According to John Skruch, Atari's Associate Director for Software, Atari-Writer 80--a new 80-column upgrade of the AtariWriter Plus word processor--was undergoing final testing at deadline and should also be in the stores when the XEP80 arrives in June 1987. AtariWrriter 80 and a new 80-column, single-density version of Atari's Silent Butler personal finance program will be the first commercial software that runs on the XEP80. 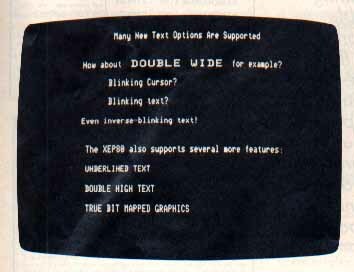 However, early prototype versions of the XEP80 box were sent to major publishers of 8-bit software--such as Batteries Included, Broderbund, XLEnt and OSS--with the expectation that existing products will soon be updated for 80 columns. Inexpensive 80-column trade-up prices for users of the existing AtariWriter Plus and Silent Butler will be offered by Atari, according to Skruch. But no prices for the software have been set as of this writing. The XEP80 is about the size of a 1030 modem (5 3/8 x 9 1/4 x 1-3/8 inches) and weighs in at just two pounds. It can easily fit atop your disk drive. Keeping the system running is a small 9-volt power supply, the same power unit used with the 2600 videogame system and the still-awaited Atari 1200-baud modem. Note: The power supply that came with our prototype XEP80 tended to grow unusually hot. The XEP80 also includes a parallel printer port that uses the same 25-pin cable as the ST. If you hold down the [SELECT] key when you boot your computer, the XEP80 will serve only as a parallel printer interface--without turning on the 80-column display. The disk that comes with the XEP80 contains the AUTORUN.SYS file which installs the handler (which is only about 200 bytes). Commented MAC/65-compatible source code for the handler is also included. Atari's Lane Winner is credited as the main designer of the XEP80 system. The disk also features a number af impressive demonstration programs written in BASIC and assembly language, as well as detailed documentation and utility software for inserting 80-column handler rountines into your own programs. - Invert the screen colors (default is white text on a black background). - Produce a blinking cursor. - Mix double-width or double-height text with standard-size text. - Mix blinking text (any width or height) with standard text. - Enable character-by-character horizontal scrolling with a POSITION statement and an XIO statement. The XEP80 is immediately compatible with all software that supports E: calls -- such as Atari BASIC (versions A, B and C) and Atari DOS 2.5. During our tests, the XEP80 didn't work with DOS 2.0. Built into the XEP80 is 8K of static RAM, which is used as a screen storage buffer to operate the display faster. The XEP80 has two complete character sets built in, the standard XL/XE special character set and Atari's international character set. The XEP80 can draw high-resolution bit-mapped graphics covering as much as half the screen. However, the 80-column drawing routines are much slower than standard 40-column drawing. It took five minutes to draw and fill a golfball-sized circle in Graphics 8. Drawing isn't simple either. The PLOT and DRAWTO statements are not supported and text windows are not allowed. If your program crashes in the middle of one of these lengthy and complicated bit-map operations, the display remains in bit-mapped mode. You must reboot and start again. If you're serious about an 80-column display, the XEP80 won't disappoint you. The text is outstanding on monochrome monitors and acceptably readable on composite color monitors. Beginning and intermediate BASIC, programmers will want to explore new ways to use the XEP80's additional XIO commands. Advanced BASIC and assembly language programmers will enjoy adapting the XEP80 handler to their favorite business software, word processor or telecommunications program.